Even worse are the cycling publishers who’ve all but declared war on the homeless, labeling them all thieves, vagrants, or worse. And then there’s their pro-developer content, arguably the most neoliberal aspect of the bike world’s bourgeois image problem. Let’s be clear: homelessness is a serious problem, it isn’t a complicated problem. But many cycling advocates get paid to obfuscate the issue into being one about zoning, supply and demand, NIMBYs, etc. This is a deliberate distraction. The reason there are homeless people is that housing is a for-profit market based on monopoly and speculation. Price is only loosely attached to demand in-so-far as developers will gouge renters and buyers for the absolute maximum amount possible. 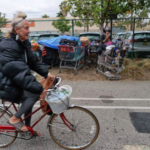 Bikes are essential tools for #homeless folks in Seattle. Virtually every tent has a bike outside, often being tinkered on by its owner. W/ a Bike, transport to a cross-town job or hot meal is practical, no bus fare. Bikes are how Seattle’s underclass gets around. Nationally, there are 6 empty homes for every 1 homeless person. There’s no reason anyone should be forced to sleep on the streets in the first place. In a sane world, those homes would be reclaimed from banks by our government for its people. In a just world, people would be able to freely take over empty buildings for the sake of shelter as a human right. So if the cycling community can recognize the injustice of climate change, or streets choked with dangerous, polluting automobiles, why can’t they recognize the global injustice of neoliberal capitalism? It’s not enough to see homelessness as an abstraction, as someone else’s problem. As people who ride bikes, we should rightly be shocked that a city like Seattle is using physical bike infrastructure to purge out a homeless camp. We should be just as outraged that a privatized housing market leaves hundreds of thousands of Americans without a roof over their heads in the first place.